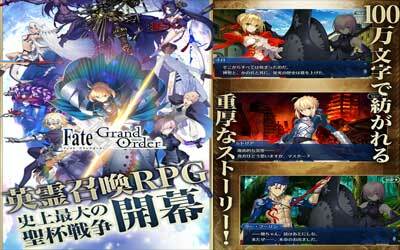 Previous version Fate/Grand Order 1.30.2 apk for Android will help you to downgrade or install older app easily. This is one of the best Role Playing apps. The battle system in Fate/Grand Order is quite complicated compared with mobile games on normally. Before starting the quest, players must draw up party consisting of 6 servant (could be less), 3 servant at the forefront (2 servant belonging to the player himself, one servant owned by a friend), and 3 more as a backup if one servant at the forefront retreat, In the battle itself, on the turn the player, the player can activate a wide range of innate skill of servant or skill players themselves. Skill provided quite powerful, like making a servant does not receive any damage at all during one turn or add significant damage. It should be noted that these skills have a long cooldown, so it requires the player to activate skill wise, let alone the skill affects only the one servant who selected only. Every servant also has a special bar called “NP”. The bar was filled with a special command, and when full, the servant may issue the special moment every time a player is required. On this screen, the player must be ordered servant 3 times, from 5 commands provided every turn (if one servant, having bar NP 100% to the top, then there is the addition of one order for execution “Special Skill” the servant). Command to attack in this game there are three kinds, namely “Buster”, “Arts” and “Quick”. “Arts”, is the basic command for a servant, in which the servant will attack and emphasized charging bar NP and produces several critical points. “Buster” is a type of attack with full force, the resulting damage is greatest between the two other command, but this command does not add bar NP and not produce at all critical points. Last is “Quick”, the attack command the weakest of them all, but each hit 99% produce critical points and adding bar NP, although not as much as “Arts”. Not only that, the command sequence also influences the effects, as if the “Buster” is placed in the third command, the level of damage that is generated is higher, than if placed in the first command. There is also a system of “Chain”, where when a player executes three commands with the same type of attack or third order with the same character, in turn will be given the special effects which may distort conditions of battle. Optimized command card Battle of easy operation in smartphone! Players continue to unravel the mystery defeat the enemy puppet remembrance we become a master. Or fight in remembrance of preference, a strong fight or battle style in remembrance the player becomes available. Look like this game use a lot of ram. A little lag in mid class smart phone. And i hope English language will be available in this game.